Interim results of a placebo-controlled, phase 3 study showed that patients suffering from metastatic thyroid cancer had longer progression-free survival when treated with the drug known as Sorafenib. The study encompassed about 420 patients with refractory differentiated thyroid cancer that had progressed in the past 14 months. 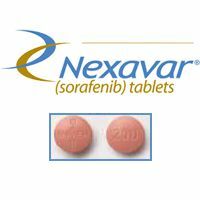 The patients' treatments were randomized to placebo or Sorafenib (Nexavar). Sorafenib acts by inhibiting VEGFR1-3 and Raf kinases. Seventy percent of patients taking the placebo switched to open-label Sorafenib once their disease progressed. Sorafenib was associated with 10.8 months of progression-free survival, compared with 5.8 months in the placebo group.